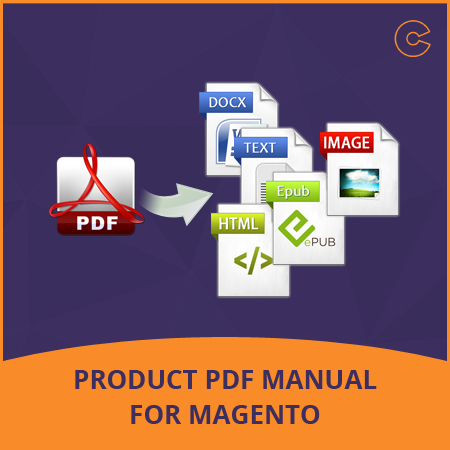 Now with the help of Magento Product PDF Extension, you can easily upload and manage all types of product files manually. You may upload files for multiple products as well as single product at a time. Also, extension allow users to download the product information file from the product description page. The best part of this extension is that it shows all the product information such as name, type & size automatically and support all type files like PDF, Word, JPEG, etc. Now you can upload PDF manual for any particular product and also check the manual by clicking on product link. Step 3: Now Go to Catalog > Manage Product > Click on product in which you want to upload product manual. Step 4: Now in left Product Information Panel Click on last Tab PDF Uploader and upload your Products Manual from here. Step 5: After uploading the product manual visit the front-end of the particular product and you will see the Link "Click here to Download Manual". Easily upload and manage the product manual for individual product. View the file name and the file location of the PDF through the Admin Product Dashboard. Easily manage various files on a product page. Easily attach single file to the different product pages. Display product name, type and size automatically. Upload all type files like PDF, Word, JPEG, etc. Customer can view or download that manual from product page. To download file, just click on product manual link. Easily get the product information. High quality PDF for each product page. Q: Error 404 after installation while browsing PDF management in admin? A: If you get Error 404 after installation while browsing PDF management in admin, please flush the cache, log out from admin and log in again. You can manage the configuration without 404 error now. A: To upload the product manual through the admin just Click on Add Product / Edit Product Just Look at the Left Sidebar, you will get the PDF Manual Menu click on it and upload the product manual from here. Easily upload the product related different file such as PDF, Word, JPEG, etc in an e-Commerce Magento website and allow customers to download the product files from the product description page.